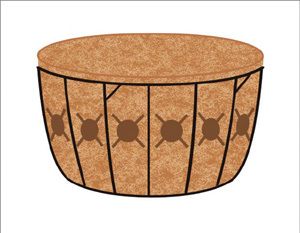 16" diameter x 7" deep -holds twelve side plants, twelve top edging plants and one 6" or gallon size centerpiece plant. Side planted hanging baskets look terrific from below as well as from the side. Hang them in groups of three or spaced singly along a porch. 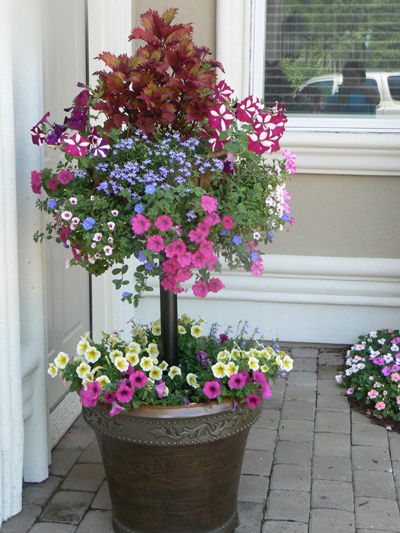 Or use our Border or Patio Column Kits designed just for these Basic Basket Planters. 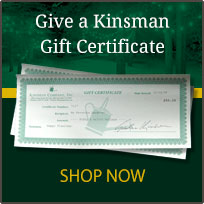 I love my Kinsman baskets! (Sitting looking out the window at them as I write this review) They are simple sturdy pieces. Both the liner and frame have a nice weight to them and the holes in the liner were easy to use as well! 10/10 recommend! Loved planting this pot!! Looks great already!!! It is a bit difficult to get the plants into the side holes. However, once that is accomplished, it looks gorgeous! And the plants actually survived the " trauma"! I purchased one of these a few years ago and loved it. I bought this one for my Mom with the disk and mounting plate. She has a 4 x 4 and it will love great. She's excited. We need to wait for warmer weather. Thanks for the great products.